While Americans may think of e-waste—the remnants of discarded electronic devices like computers and cell phones—as a significant environmental problem here at home, the issue has reached an unprecedented state of severity in the country of India, where the unprivileged have taken to harvesting valuable materials found inside these devices, such as gold and copper. India is considered an impoverished nation where the median income rests at only 1500 dollars. But its economy is growing, and as the middle class expands and becomes wealthier, electronic devices are becoming more prevalent in the country, meaning that the resulting waste is also more prevalent. As a result, the nation’s poor have instituted a number of techniques for harvesting valuable parts from these electronics. Those techniques include burning wires to get to the copper between them, as well as pouring cyanide onto circuit boards in order to release gold. Unfortunately, without stringent laws protecting the environment in India, much of the resulting chemical waste is dumped into rivers or drains, where it can become extremely toxic to humanity and the environment as a whole. Interestingly, this problem of domestic e-waste only recently shifted from an even more severe one involving imported e-waste. Until recent enforcement of strict laws in Europe and the U.S., companies in those cultures shipped their discarded electronics to developing nations like India, where recycling and environmental laws are far less extensive. In 2012, however, the U.N. reported that for the first time ever, domestic e-waste in developing countries outweighed the imported waste, reflecting the significance of this growing issue that still lacks sufficient regulations or enforcement. 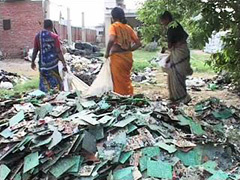 Domestic e-waste in India is now up to an all-time high of one million tons per year. Without legislation to curb the disastrous effects of e-waste in India, the country’s people are increasingly vulnerable to long-term health concerns, while the environment may sustain damage that could take decades (or even centuries) to reverse. Posted on July 4th under Pollution Reduction.